The town of Beauséjour, with or without the accent, is directly translated from the French as beautiful place to live. If you are not a prairie person, you may have some doubts about that statement and assume the first settlers were just desperate and grateful to find fresh water nearby. Why would anyone want to live in Manitoba without, at the very least, the perks of Winnipeg shopping as compensation? The answer is simple. It's stunningly beautiful. The town itself is very small - only 2700 people. It's part of a larger rural municipality called Brokenhead, named for the river than runs through the area. Nearby are the sparkling lakes and sandy beaches of Whiteshell Provincial Park. 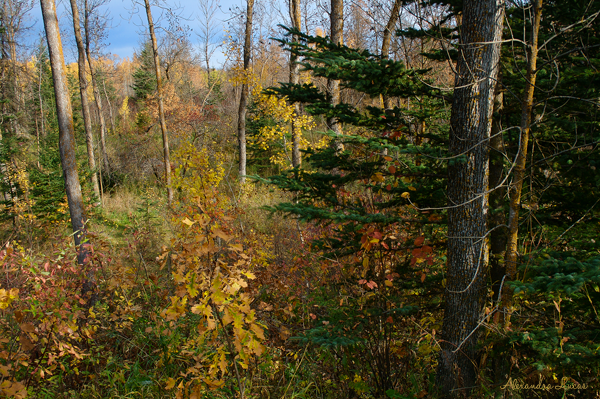 The scent of jackpine is in the air and there are places to explore that leave you feeling as if you've stepped into a painting by Tom Thompson. This part of Manitoba straddles the line between the rugged Canadian Shield and the open prairie. If you had been here a million or so years ago, you would have been standing on the edge of the first part of North America to permanently emerge from the sea. Under your feet even now is exposed Precambrian rock formed 500 million years ago. 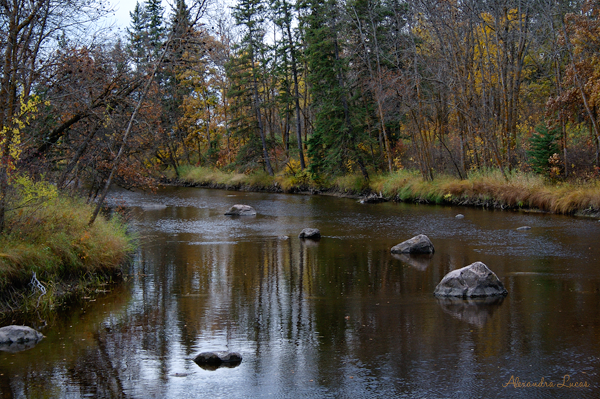 On one side of you is the deep boreal forest, teeming with wildlife. On the other is the flatland that stretches more than 1200 kilometres west to meet the Canadian Rockies. Is it really that cold in the winter? Are the summers warm? Yes, it can be cold. The record low is -52°F, without windchill, but an average winter day isn't that frigid. For anyone who has not experienced frozen nostrils, it can be a little disconcerting at first but it won't stop you enjoying the outdoors. The summers are very warm and temperatures climbed to over 100°F one year but that was usual. Nearby beaches are a favourite weekend destination for many in the area, including those from the 'Peg. It's only about an hour's drive from the city. So what brought people here? The years from 1890 to 1910 saw many immigrants arrive from Eastern Europe, the area referred to at that time as the Austrian Empire and what we know today as Poland, Germany, and Ukraine. 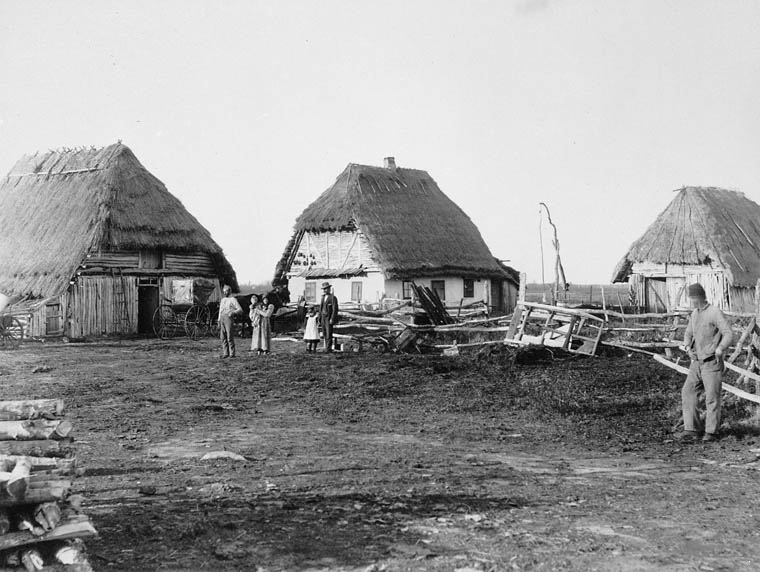 Jewish settlers arrived from Galicia and Bukovina. They were granted homesteads through the Dominion Lands Act (1872), usually 160 acres for a fee of $10, and they would be awarded a Land Patent after certain improvements had been made within a specified time period. Within three years they had to clear from 15 to 50 acres of land, build a residence, and plant from 10 to 30 acres of crops with what they managed to bring with them in wooden trunks from the old country. Given the climate, it meant very hard work. Home was often a sod-covered hole in the ground until the land was cleared and planted. Did I mention the hordes of mosquitoes? After all this work in very little time and with two witnesses to testify to its completion, they could then apply for the Land Patent. That's how this community was built. The photo at right shows Galician settlers in a community to the south. Beauséjour was home to the first glassworks in Western Canada, supplying bottles and containers made from the fine silica in the area. Its location is now a heritage site. Agriculture and tourism are the cornerstones of the region's economy today. Its proximity to Whiteshell Park and cottage country make it an ideal getaway for a weekend. 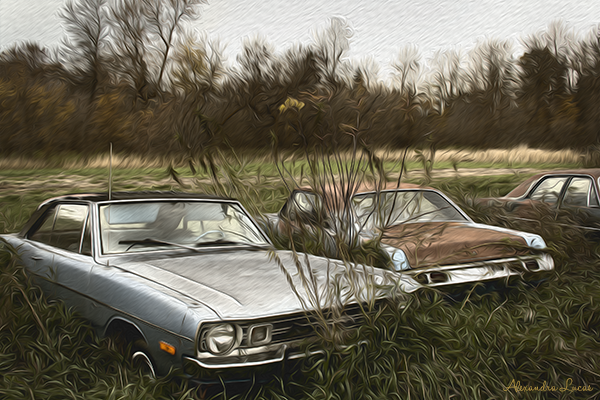 It's home to the Canadian Power Toboggan Championships, the Double B Rodeo, Shades of the Past Classic Car Show, and The Great Woods Music Festival. 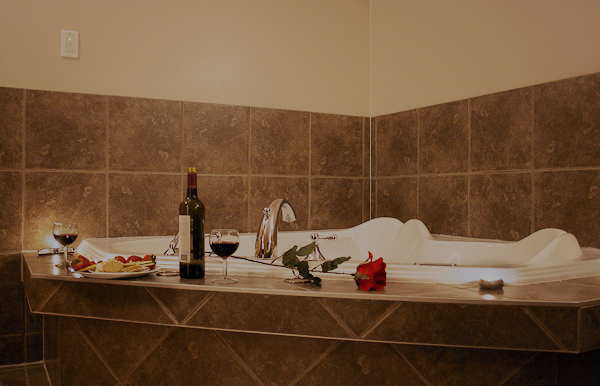 If you are looking for a more romantic weekend, try Getaways Romantic Retreat. Yes, they know how to have fun in the woods. Beauséjour has come a long way from its humble beginnings but has retained pride in both its heritage and in its contribution to building Canada. If you have the opportunity to visit, you won't be disappointed. It's another gem in this vast nation we call home.